Will Chrono appear in the new anime? How is Legion affected by Force? Producers answer 20 questions from fans. March 16th, 2018. At 9:00 PM Japanese Standard Time, Cardfight!! 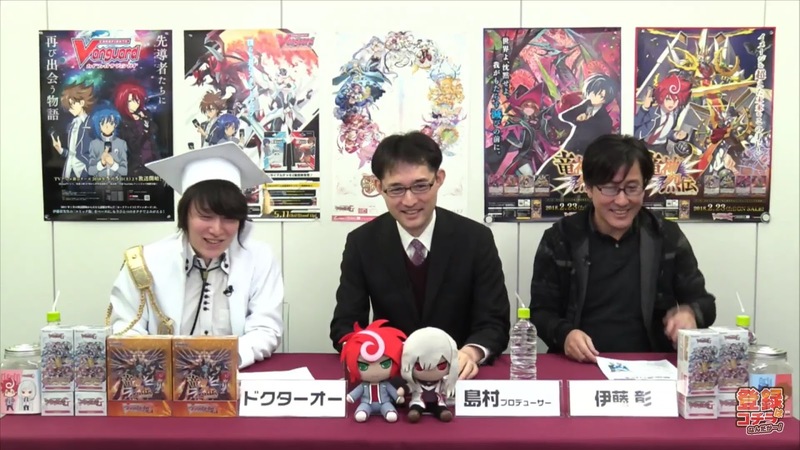 Vanguard representative Doctor O began a special Weekly Bites stream alongside executive producer Shimamura "Shima-P" Masatoshi and original concept creator-manga author Itou Akira. The three of them answered 20 questions from fans about the new anime and game mechanics, and unveiled the first set of shop tournament promotional cards for the Standard format of the Cardfight!! 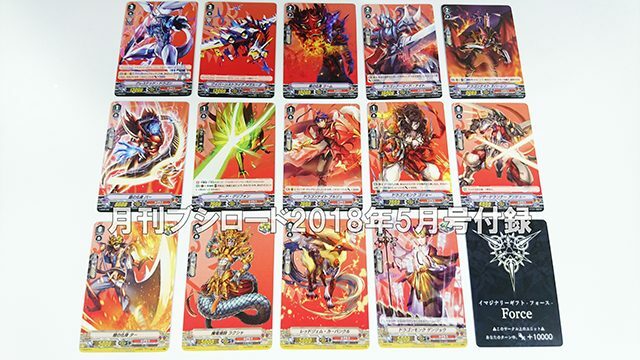 Vanguard Trading Card Game, which will formally begin in May for Japan. The special episode of the stream was only announced the day before, and aired on both YouTube and NicoNico Live, with approximately 2000 and 1900 viewers joining in at peak times. 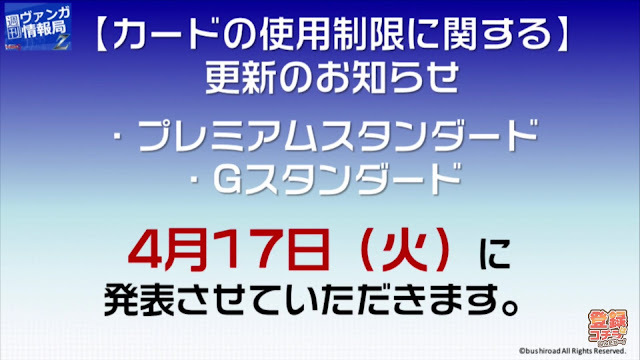 With regard to the appearance of G Units in the new anime and card game reboot, Shimamura stated that he was "unclear" on it. Explaining that "in the era Aichi and his friends live in, G Units do not exist yet," Shimamura considered it unlikely. In light of the official website displaying Gift Markers being used on a field with no G Zone present, this implies that no new strides will be printed for Standard format in the immediate future. Concerning to the Cray Elemental and Etranger clans, Shimamura is likewise ambivalent on whether or not Cray Elementals will be available in the card game. 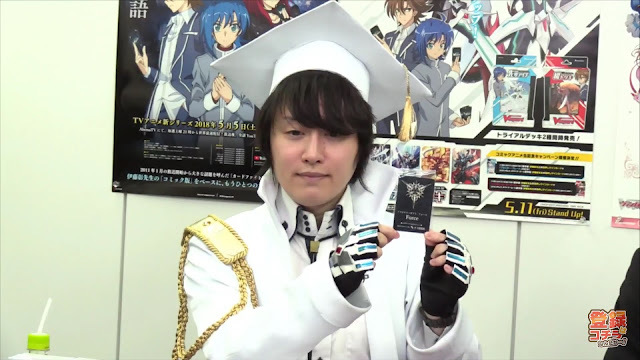 As Etranger deals with cameos not from the world of Vanguard, he's certain players won't be able to build a full deck of them in the new series. For players that want to continue using G Units and Cray Elementals, Shimamura and Doctor O encouraged them to play the Premium format instead. The May promotional cards for Standard format will be High Dog Breeder Seiran, and an alternate artwork print of Pongal from V-Booster Set 01: UNITE! TEAM Q4. Seiran is the participation prize for May, while Pongal is given exclusively to the winner and has embossed congratulatory text. This Pongal is being done in the style of an Origin Rare, using its 2011 artwork from BT02: Onslaught of Dragon Souls alongside its new effect. 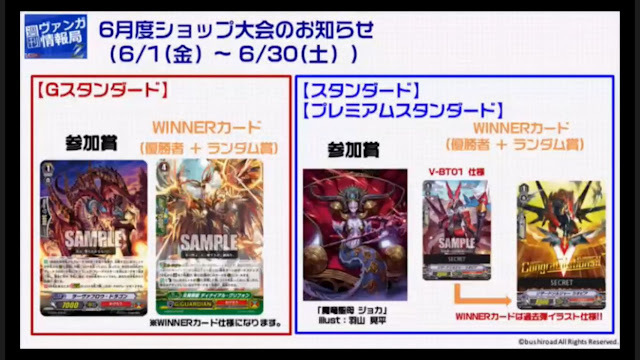 For June the Standard format participation prize will be Demonic Dragon Madonna Joka, and the first-place prize will be an alternate artwork print of Lizard Soldier Raopia from V-BT01. Like Pongal, this Raopia is using its 2011 artwork from the BT04: Eclipse of Illusionary Shadows. The skills of these promotional cards remain "secret." Doctor O also announced that Roselia, the band responsible for the opening sequence to the next anime season, will be performing a cover of JAM Project's Believe in my Existence as part of a crossover with Bushiroad's BanG Dream! Girls' Band Party! franchise. 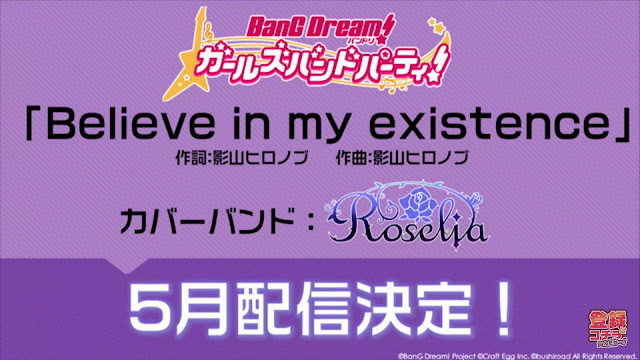 Believe in my Existence was originally used as the second opening to the first season of the Cardfight!! Vanguard anime, used from September 2011-March 2012. The cover will debut in May. The new restricted list for the Premium Standard and G Standard formats will be released on Tuesday April 17th. According to Shimamura, both the Premium Standard and Standard formats will be continued for "a long time." Premium is intended to be Vanguard as it has been up to now, while Standard will be a new body of regulations for a new Vanguard; these two will coexist, while G Standard will eventually be discontinued in October. 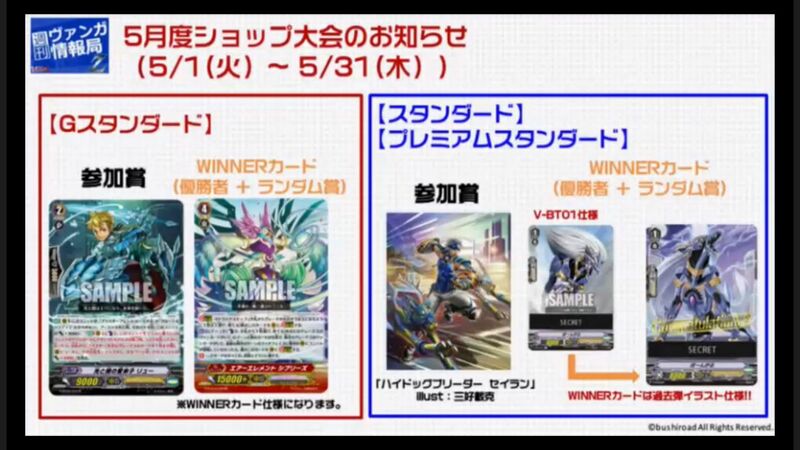 Doctor O also briefly showed cards from the first two 25-card flash fight decks, which will be used in training sessions across Japan from April 16th to May 30th. The full contents of the Star Drive and Crested Dragon decks have already been posted to the Japanese Cardfight portal. 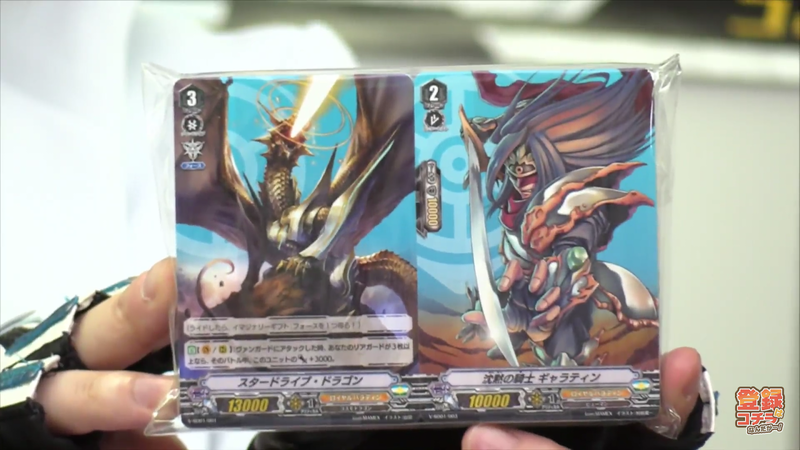 A special version of the Crested Dragon deck will be distributed in the May issue of Monthly Bushiroad magazine, containing an alternate artwork of Dragon Knight Nehalem that uses his 2011 artwork from TD02: Raging Dragon of the Empire. Doctor O shows off the Force Gift Marker. 1.) Will Chrono and his friends, and the other G Series characters appear in the new series? Itou: I can't say they won't. Doctor O: Chrono does exist in this new world, though? Itou: He does. [...] The manga is the basis for this new series, so we're following Aichi right now. Shimamura: We're starting from the beginning with the manga as the base. Itou: It's not exactly the "Comic Chapter" in the way that Vanguard G is the "G Chapter," but a new title. 2.) Will the broadcast/information delivery system used up to now continue? Shimamura: It will continue on NicoNico Douga and YouTube. 3.) Is "Origin" the formal subtitle of the new series? Shimamura: My apologies, it is not the formal subtitle. "Origin" is just a code name. 4.) Are Gift Markers only in trial decks? Shimamura: Aside from the 3 Gift Markers you get in a trial deck, they will be available elsewhere, in booster packs and such. 5.) Please explain where we should place Gift Markers, how many we can have, how we should sleeve them, etc. Shimamura: Gift Markers are placed approximately in the area used for the G Zone. They should be sleeved differently from both your main deck and your G Zone. You may have any number of Gift Markers. Doctor O: Though it might be hard to use more than three. 6.) Do we have to use the Gift Markers found in official products, or can we make our own? Shimamura: In free play you may do as you please, but in the official tournaments you must use official Markers. 7.) Are the Gift Markers "Force" and "Accel" treated as cards while on the field? Shimamura: No. Gift Markers are not cards. For example, they are not affected by Perfect Performance Ange. 8.) If a circle with "Force" or "Accel" on it is Locked, what do we do with the Gift Marker? Shimamura: The circle becomes a Locked circle, but that is all. Even the card on top of a Marker is Locked, the Marker remains, and when it Unlocks, the Marker is still there. 9.) What happens if you Dominate a unit with a Marker on it? 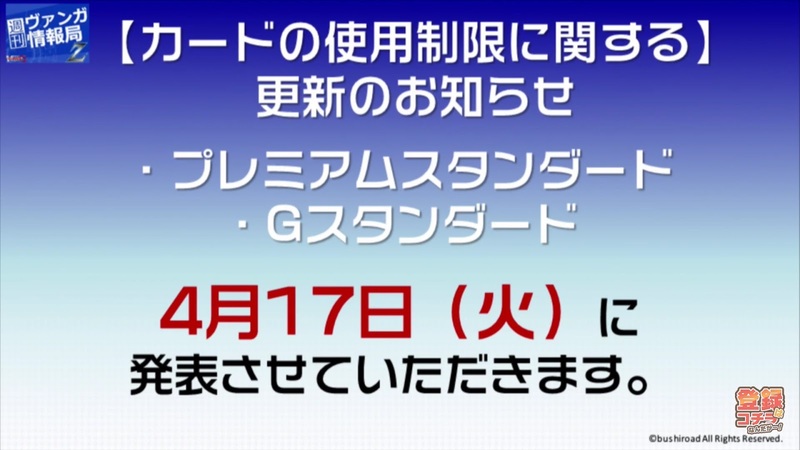 Shimamura: [Force and Accel] Gift Markers only take effect "on your turn," and you only become master of the unit, not the marker, so it does not take effect while the unit is Dominated. 10.) What happens if the "Protect" Marker leaves my hand? Shimamura: It returns to the Gift Marker area. Protect cannot exist outside of the hand or guardian circle. If it's placed from hand to rearguard Locked [like with Chaos Universe] or if it's bound from hand [like with Euryale] the Marker simply returns to the Gift area. 11.) Can the "Protect" Gift Maker be chosen for Super Dimensional Robo Daikaiser's effect while it's on the guardian circle? Shimamura: When it is placed into the guardian circle it becomes a unit, so it can be chosen and broken by Daikaiser's skill. 12.) Will the triggers made up to now, that give +5000 power, become +10000 power triggers? Shimamura: They will not. +5000 power triggers will remain +5000 power triggers. Although the power differential may make you want to use one over the other, many +5000 power triggers still have desirable abilities. So it's a trade-off. 13.) What will become of the Stand Trigger? Shimamura: There are no plans to print new Stand Triggers in the future. Existing triggers can still be used. 14.) Will Narukami, Oracle Think Tank, Pale Moon, and Granblue ever get unique effect heal triggers? Shimamura: It may take some time, but it will definitely happen. 15.) Will the activation conditions for "Stride" and "Legion" change? 16.) If the vanguard circle is under the effect of "Force," and you have a Legion active, how does the power increase apply? Shimamura: Both the Legion Mate and Legion Leader get the power boost from a single Force applied to the vanguard circle. So if you have a 20000-power Legion, one Force would make it 40000-power by increasing both halves by +10000. 17.) When performing Legion, if a Front Trigger activates, what becomes of its power? Shimamura: Because Front Triggers affect the entire Front Row, both Legion Mate and Legion Leader will gain +10000 power. 18.) At the Great Vanguard Festival's Fight Corner, what regulations will be used? Shimamura: Because of the timing [April 29th-30th] we will use the regulations from up to now. 19.) What regulations will be used during the Bushiroad Card Fight and World Grand Prix? Shimamura: BCF will use Standard and G Standard. Premium Standard will only be used in Free Fights. WGP will use Premium Standard and Standard. 20.) Will there be a new 3DS game? Shimamura: I'm sorry, but it's up to FuRyu. I would like a new 3DS title, but it's in their hands. The next regular episode of Weekly Bites will air March 20th, at 9:00 PM JST.